Coincidently, just after posting my article about transportation factoring companies, I saw an article published online by the Motor Transport publication, suggesting that bad debts have risen significantly within the road transport sector. The article sites figures regarding the road transport sector, released by Credit Safe. This statistics show that in the first quarter of 2018, while sales have increased, quarter on quarter, by 1.3%, retained profits slid by 11%. Bad debts within the sector have apparently jumped, as the money owed to road transport companies has increased by a huge 337%, again quarter on quarter. This is undoubtedly going to place further pressure on the sector, on top of increasing fuel costs, staff costs and fears over the impact of Brexit. There are significant cash flow pressures created by bad debts. These will be services that have been provided and are then not paid for. Even the increase in money owed will place pressures on any company experiencing such a huge slow down in customer payments. The longer the customers take to pay, the longer it is until you can use that cash to pay suppliers, staff etc. These problems are exactly the sort of issues that can be alleviated by using a factoring service. Firstly, prepayments against outstanding invoices, including those invoices which are currently outstanding on your sales ledger, can release that cash that is currently locked up. Typically a factor will release 85% of invoice values (with the balance paid when the customer pays - unless you choose a credit protection option). The service comes with credit control support, but the way this works can vary according to your needs. Alternatively, you can retain the collections in house and opt for what is called invoice discounting - this is the funding only (and bad debt protection if you want it - called Protected Invoice Discounting or PID). Factoring also offers a credit protection option, whereby you are protected against taking customer bad debts. The factoring company will write credit limits on your customers, and providing you trade within those limits, your invoices are covered in the event of your customers becoming insolvent and not paying. 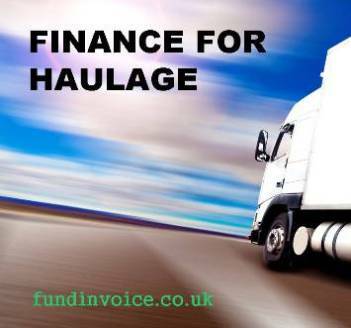 For more details about factoring for road transport sector companies, please speak to Sean on 03330 113622, or use the green quote request form on this page.